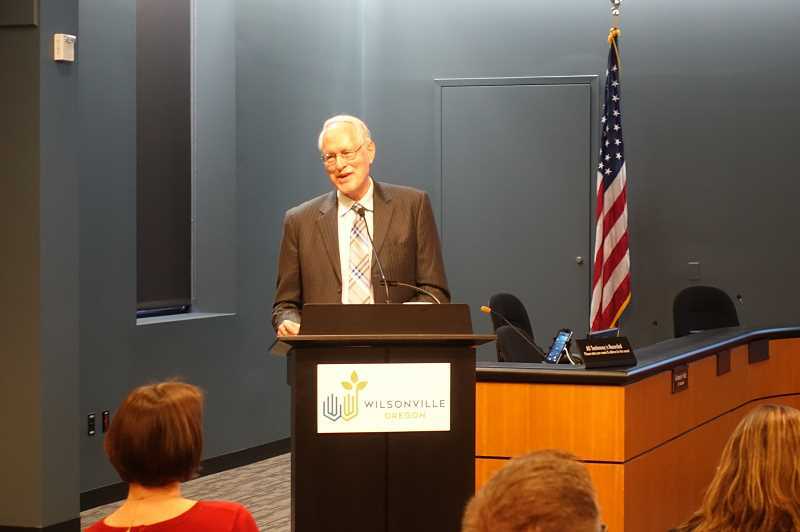 Wilsonville Mayor Tim Knapp gave his 10th State of the City address Monday, March 18, at Wilsonville City Hall and discussed issues ranging from congestion to housing to industrial development. Along with advocating for a comprehensive study of the I-5 corridor, Knapp mentioned the Oregon Department of Transportation's study completed last year to analyze the impact and feasibility of an I-5 southbound auxiliary lane and a proposed project that would tether seismically retrofitting the Boone Bridge to the auxiliary lane initiative. ODOT slates the project for completion between 2028 and 2040. "The City is lobbying at the state and federal levels to move that project forward on a foreseeable timeline," Knapp said. The mayor also said Clackamas County's recently approved $30 vehicle registration fee would provide the City with $500,000 a year to improve transportation infrastructure and that County road improvements could benefit Wilsonville residents. "We intend to be a part of the decisions on that (county road improvements) also," Knapp said. "One area we're specifically concerned about that might be a candidate for that kind of funding support is the intersection of 65th, Elligsen and Stafford Road on the north edge of town." One future goal will be to increase housing affordability and diversity in the city, though the mayor didn't specify what the city could do to address that issue. "We need to figure out how to encourage more diverse housing types and price levels to meet the varying needs of all our Wilsonville residents," Knapp said. As for transit, Knapp lauded the work of Wilsonville's South Metro Area Regional Transit (SMART) to garner $3.8 million in competitive federal grants in recent years to add compressed natural gas fleets and its push to expand service on weekends and evenings and increase trips to nearby areas. He said the total payroll of $1.1 billion doled out to Wilsonville employees and the 21,000 work-force population is unique to Wilsonville and that the nascent Coffee Creek and Basalt Creek industrial areas will add to the city's growing economy. "Wilsonville is focused on providing the infrastructure that cultivates high-wage jobs that can support families," Knapp said. He also mentioned the construction of Frog Pond residential areas as notable future developments. Work currently is underway at Frog Pond West, which will be home to NW Natural's Street of Dreams this summer. The Metro regional government added Frog Pond East and South to the urban growth boundary in 2018, and Knapp said master planning will be completed for those areas in the next three to four years. Due to the high costs of adding new roads, sidewalks and other infrastructure, Knapp said Frog Pond West won't include affordable housing. "Frog Pond West will be a traditional, suburban, single-family home neighborhood, which will help balance out the city's portfolio of housing," the mayor said. Today the percentage of multifamily housing units in the City is over 50 percent. Knapp also championed the City's work to update its Parks Master Plan and establish a blueprint for Boones Ferry Park, which will lead to improved access to the Willamette River, additional sports fields in Memorial Park and a new Memorial Park dog park, among other changes. Also proposed is the West Linn-Wilsonville School District's new performing arts center at Wilsonville High School, which would be open to community groups outside of the district. Finally, Knapp encouraged Wilsonville citizens to help the City realize its vision for the community. "Our ongoing goal, and I think the overarching challenge, is to create a safe, desirable, aesthetically pleasing community that nurtures, sustains and connects us all throughout our lives," Knapp said. "We need all Wilsonville citizens to join in this work if our combined efforts are to yield the future we envision. Will you join in? Together I believe we can achieve the vision." During its March 18 meeting, the Wilsonville City Council also authorized a $3.8 million loan to fund Garden Acres Road and enter into an agreement with the jurisdictions (such as Clackamas County and the West Linn-Wilsonville School District) in the Coffee Creek Urban Renewal Area for the repayment of the debt. It's a 10-year loan with an interest rate of 3.19 percent. The City did this to jumpstart development in Coffee Creek, which has stagnated, and hopes that eventual development there will repay the debt. "This is the lowest-cost alternative we have found to move forward with the Garden Acres Road improvements," Knapp said. "We've found in our discussions with the private sector that the private sector needs to have the confidence that the City is providing public amenities so it will be prepared for private side investment."